Willie standing by Patton’s belongings, 1945. 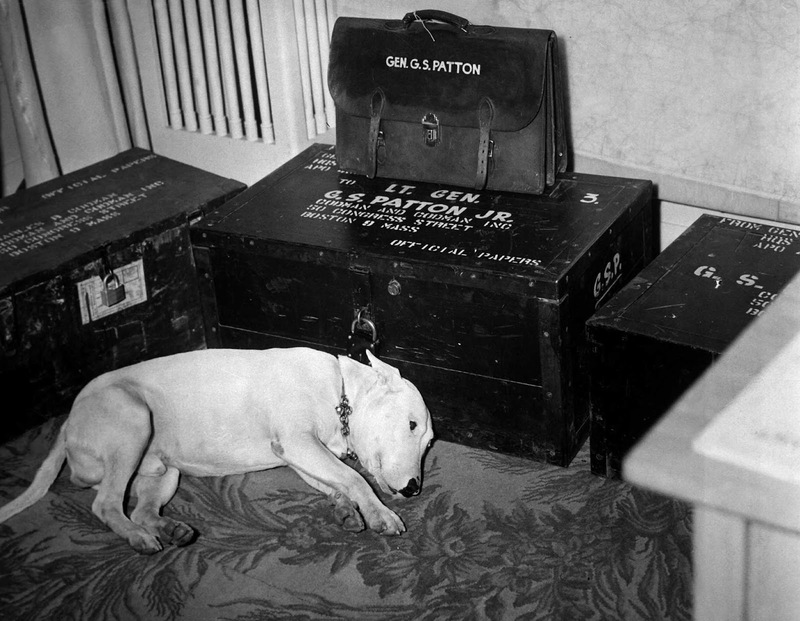 This picture of Willie, Patton’s dog, was taken a few days after the General’s death as preparations were made to send home his effects. Cartoonist Bill Mauldin describing the moment: “Beside him, lying in a big chair was Willie, the bull terrier. If ever dog was suited to master this one was. Willie had his beloved boss’s expression and lacked only the ribbons and stars. I stood in that door staring into the four meanest eyes I’d ever seen”. Considered one of the most successful combat generals in U.S. history, General George S. Patton was a devoted dog lover. While leading troops during World War II, Patton was looking to get an English bull terrier puppy. The dog was originally named ‘Punch’ and the story was that he was the pet of an RAF pilot who sometimes took ‘Punch’ on bombing missions. When the pilot did not return from a mission, his wife sold the dog. 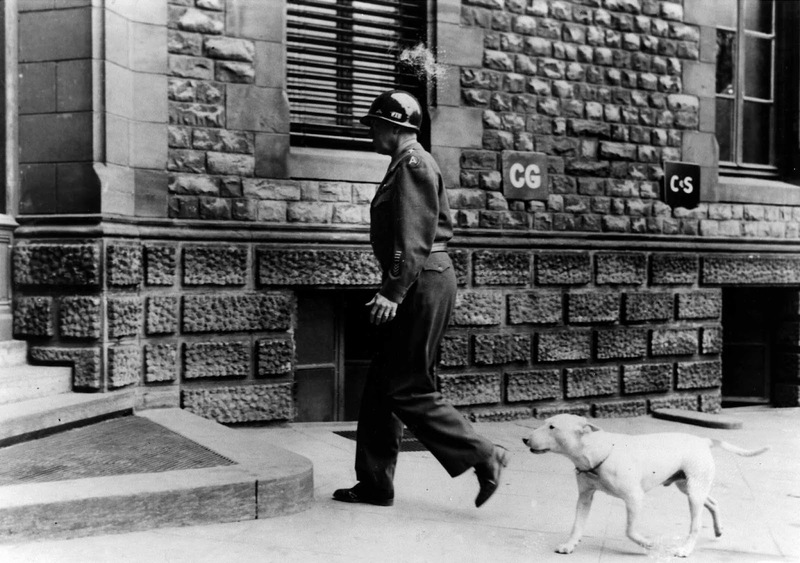 Willie following Patton as he enters his Headquarters at Luxembourg. 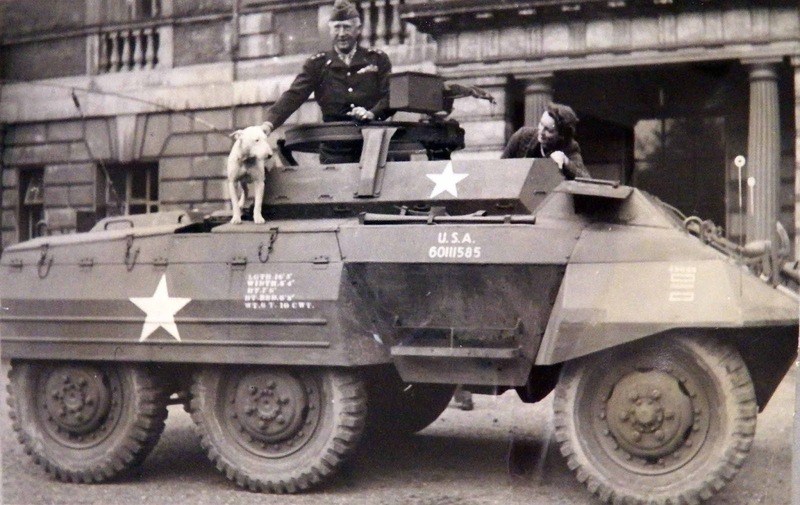 Patton’s staff purchased Willie on March 4, 1944, in England, and Gen. Patton wrote in his diary concerning the dog: “My bull pup took to me like a duck to water. He is 15 months old, pure white except for a little lemin on his tail, which to a cursory glance would seem to indicate that he had not used toilet paper…”. He named him Willie, but not after “William the Conqueror” as the movie “Patton” suggested. The dog was named after a young boy that Patton had met during the Depression who ate his fill for the first time at a BBQ Patton was hosting. Willie was known to follow Patton everywhere, and the two were seldom separated while in England. According to some accounts, Willie would enter a room and alert soldiers in there that Patton was on his way. When Patton was traveling through Europe, fighting the war and sleeping in his mobile van, Willie would sleep there with him. Patton had G.I. dog tags made for Willie and once hosted a birthday party for his “second in command”. He indulged his dog’s every whim until December of ’45, when Patton died from injuries sustained in auto accident in Germany. Willie was sent home to live out the rest of his life as the beloved dog of a fallen warrior with the General’s wife and daughters. He died in 1955 and is buried in an unmarked grave (with other family pets) by a stone wall on the property, which is still owned by the Patton Family. Patton on his M-20 in England with Willie. You might not agree with all General Patton said and did but there is no denying that he was a great leader. I admire his courage, tenacity, and loyalty. What more can you say about a man who LOVES HIS PET. It is truly remarkable when the pet truly is devoted to the man. I love George Patton he was America's General. and what the motivation was for this war.